2002-03-21 Application filed by United Video Properties, Inc. filed Critical United Video Properties, Inc.
Systems and methods are disclosed for providing an interactive television system for recording television programming. The interactive television system may include components for providing personal video recorder (802) functionality, such as an interactive television program guide (904), PVR extensions(902), PVR application programming interfaces (906), a PVR device(802), any suitable hardware or software, or a combination thereof: These components may be implemented in, for example, an arrangement having an integrated PVR-compliant device with PVR device(802), or in an arrangement having a PVR-compliant device, e.g., a set-op box (1400) coupled to PVR equipment (e.g., a remote PVR server or a PVR sidecar(1401)) with a PVR device (802). No. 60/290,714, filed May 14, 2001, all of which are hereby incorporated by reference herein in their entireties . Products have recently been developed that allow users to manage their viewing experiences and record media with increased flexibility. PVRs, such as those provided by TiVo™ and ReplayTV™, record programs on hard-disk drives configured for multi-media storage. Users may schedule programs to be recorded and may play back the recorded programs at a later time. These products also record what users are watching in real-time, allowing users to pause real-time programs when, for example, the user must leave the room. The product may continue recording and storing the program being broadcast while the displayed program is paused. Users may resume their viewing where they left off, and may fast forward through commercials until they reach the point at which the program is currently being provided. Interactive television applications, such as IPGs, are now widely available to the general public. IPGs may be used to provide interactive television services. Interactive television services include services for allowing a user to tune to a program, set parental locks, record a program, set reminders, etc. IPGs may allow users to record programs on digital or analog storage devices (e.g., videocassettes, hard disks, floppy discs, flash memory, recordable compact discs (CDs) , and recordable digital versatile discs (DVDs) ) . Programs may also be recorded on a program guide server, Internet server, or other server. The program guide server may be located at, for example, the cable system headend. The program guide may be an on-line program guide, which may be implemented using a web server on the Internet . However, in most cases, the IPGs that facilitate television viewing remain separate from the applications that offer PVR functionality. For example, PVRs may include IPGs that are separate from the IPGs provided by other user equipment (e.g., a set-top box) and may require input devices and graphic interfaces separate from those used with existing IPGs. Subsequently, users often experience difficulty integrating existing IPGs with video recording applications . It would therefore be desirable to provide an interactive television system having PVR functionality in which the user may use an IPG seamlessly with PVR functionality. This and other objects of the present invention are accomplished by providing a PVR-compliant media recording system with an architecture that may include, for example, a PVR device, PVR application programming interfaces (APIs), PVR extensions, storage devices, and any additional hardware or software, or combination thereof, for the purpose of integrating PVR functionality to an IPG. The high-level hardware architecture may involve a PVR-compliant device and PVR equipment having a PVR device. The PVR-compliant device may include an IPG that provides a user with the ability to record television programming. The user may control the IPG functionality by sending a command to the PVR-compliant device. A signal corresponding to the command may be generated by the PVR-compliant device and may be communicated to and executed by the PVR device. The PVR-compliant device may include software and hardware configured to implement an IPG, PVR extensions, and PVR APIs. The PVR device may be coupled to the PVR-compliant device, and the PVR APIs may be configured to facilitate communications between the PVR device and the PVR-compliant device. The PVR device may include software and hardware configured to implement an IPG, PVR extensions, and PVR APIs. The PVR-compliant device may include hardware interfaces and software interfaces that may provide an IPG with PVR features. The PVR extensions and PVR APIs may be configured to provide a seamless integration of PVR functionality with the IPG. For example, PVR- compliant applications may interface with existing IPGs implemented in other hardware, such as a set-top box, to perform the PVR functions. When coupled to a PVR device, the PVR-compliant device may detect the PVR device being coupled, determine the type of PVR device being used based on information received from the PVR device, and establish communications with the PVR device based on the information received. This may be accomplished using intelligent PVR APIs implemented in the PVR-compliant device . In a similar manner, the PVR device may detect the PVR-compliant device being coupled, determine the type of PVR-compliant device being used based on information received from the PVR-compliant device, and establish communications with the PVR-compliant device based on the information received. This may be accomplished using PVR APIs implemented in the PVR device . TAn illustrative interactive television system in accordance with the principles of the present invention is shown in FIG. l. Illustrative interactive television system 100 may include main facility 102, distribution facility 110, and user equipment 122. Illustrative interactive television system 100 may include multiple main facilities 102. Only one main facility 102, however, is illustrated in FIG. 1 to avoid over-complicating the drawing. The program guide information or content transmitted by main facility 102 to distribution facility 110 may include television program listings data (such as program times, channels, titles, descriptions, program type, genre, actors) or any other suitable data. The promotional information transmitted by main facility 102 to distribution facility 110 may include various promotional banners, promotional ads, promotional slogans, promotional advertisements, or any other suitable promotional material. Distribution facility 110 may include server 112 for storing such content and information. Server 112 may be used for distributing television programming, music, or any other suitable type of media in response, for example, to requests for such content and information. Server 112 may include a local database 116 for storing various information and content (e.g., program guide information) or for storing recorded programs remotely. Storing recorded programs remotely on a server at the distribution facility may be an alternative to a storage media in the user's home. Client-server based interactive television systems with remote server recording are illustratively described, for example, in Ellis, et al. U.S. Patent Application No. 09/332,244, filed June 11, 1999, which is hereby incorporated by reference herein in its entirety. Additional techniques for storing programs and program information are illustratively described, for example, in Hassell, et al . U.S. Patent Application No. 09/157,256, filed September 17, 1998 which is hereby incorporated by reference herein in its entirety. In addition, server 112 may be capable of providing other interactive services such as near video-on-demand and video-on- demand. Server 112 may include one or more computers. If desired, some or all of the information distributed to distribution facility 110 may be provided using information sources other than main facility 102. For example, distribution facility 110 may receive information from wide area network 118 (e.g., the Internet) via communications path 120. Communications path 120 may be a Tl link, a digital subscriber line (DSL) link, a cable modem link, an analog modem link, or any other suitable link. If desired, data may be provided to user equipment 122 using facilities other than main facility 102 and distribution facility 110. For example, user equipment 122 may receive data directly from wide area network 118 via communications path 62. Communications path 62 may be a Tl link, a DSL link, a cable modem link, an analog modem link, radio frequencies such as a paging system, or any other suitable link. In another example, a separate facility such as a satellite broadcasting system (not shown) may transmit data to user equipment 122, which may receive data via a satellite receiving system (not shown) . Communications path 114 may be any suitable type of link that allows distribution facility 110 to distribute program guide information, television programming, or any other suitable information, data, or media to user equipment 122. There may be more than one communications path 114 that couples each user equipment 122 to distribution facility 110. For example, if distribution facility 110 is a cable headend, user equipment 122 may receive information via a cable link and may transmit information to distribution facility 110 via a digital serial link, a dial-up modem connection, or any other suitable link. Each of communication paths 114 may be unidirectional or bi-directional. User equipment 122 may be based on a television platform, a computer platform, or both. For example, user equipment 122 may include user television equipment (e.g., a television set, a PVR, and a set-top box), user computer equipment (e.g., a desktop computer, a laptop computer, a handheld computing device such as a personal digital assistant or any other small personal computing device, etc. ), or any other suitable user equipment for implementing an IPG. User computer equipment may include a computer based receiver having integrated set-top box circuitry or a personal computer television (PC/TV) . If desired, user television equipment may include computer equipment for receiving e-mails. As shown in FIG. 2, the capabilities of server 112 (FIG. 1) may be provided using servers 202, located at network nodes 204. Servers such as ■servers 202 may be used instead of server 112 or may be used in conjunction with server 112 located at distribution facility 110. Servers 202 may include web servers, main frame computers, or any suitable device or devices. User equipment 212 may include any suitable device for providing an IPG such as user television equipment. Set-top box 302 may receive signals transmitted by distribution facility 110 (FIG. 1) (e.g., audio, video, or IPG data) . Set-top box 302 may include a storage device (e.g., a hard drive) or memory for storing personal user preferences settings, user-programmed reminders, or other information. For illustrative purposes, the present invention will be described in the context of user television equipment 300, which has set- top box 302 as its receiver or tuner. If desired, user television equipment 300 may include multiple tuners which may be used for simultaneously watching one program and recording another. IPGs with simultaneous watch and record capabilities are illustratively described, for example in Lemmons et al . U.S. Patent Application No. 09/329,850, filed June 11, 1999, which is hereby incorporated by reference herein in its entirety. Set-top box 302 may be coupled to recording device 304. Recording device 304 may include PVR 308, VCR 310, or any other suitable recording device. Recording device 304 may include one or both of PVR 308 and VCR 310. If the user desires to record a program, set-top box 302 may be manually or automatically tuned to a particular channel and control signals may be sent to recording device 304 to record that program. Data link 309 may couple PVR 308 and VCR 310, and may be a cable link or any other suitable data link. Data link 309 may be used to transfer audio/video signals for programs between PVR 308 and VCR 310. August 13, 1999, which is hereby incorporated by reference herein in its entirety. If desired, an IPG for providing the features and functionalities discussed herein may be partly implemented in PVR 308, set-top box 302, or both. Remote control 408 may include task buttons 406 that may provide means for directing a task to be performed by user equipment (e.g., user equipment 300 of FIG. 3) . Task buttons 406 may include, for example, play button 438, pause button 440, stop button 442, rewind button 444, fast-forward button 446, record button 436, "OK" button 412, or any other suitable task button. Remote control 408 may include control buttons 488 that may include volume control buttons 426, navigation buttons 430, and channel control buttons 428. Navigation buttons 430 may provide the user with the ability to adjust or move a desired element (e.g., a cursor, a highlight window, etc.) vertically or horizontally. For example, if the desired element is a cursor in an IPG display screen, navigation buttons 430 may be used to move the cursor in the display screen. "OK" button 412 in task buttons 406, in combination with navigation buttons 430, may provide the user with the ability to make on-screen selections. Remote control buttons are also sometimes referred to herein as remote control keys. In one embodiment of the present invention, interactive television system 100 (FIG. 1) may include a PVR-compliant media recording system for recording television programming having PVR-compliant device 500 of FIG. 5. PVR-compliant device 500 may include, for example, IPG 502, PVR extensions 504, PVR APIs 506, firmware 508, any other component needed to accommodate PVR functionality, or any combination thereof. Components of PVR-compliant device 500 may be located in, for example, a PVR sidecar, a PVR server, a set-top-box, any suitable location or locations, or a combination thereof. IPG 502 may be any IPG capable of displaying program information made available through distribution facility 110. PVR extensions 504 may include any suitable hardware, software, or both that may be used in conjunction with IPG 502 or any other suitable interactive television application. In one suitable approach, PVR extensions 504 may be implemented together with IPG 502 (e.g., as part of a single software component) . In another suitable approach, PVR extensions 504 may be implemented separately from IPG 502 (e.g., as a separate software module), but may work in conjunction with IPG 502 as a separate functional component . Whether separate from IPG 502 or integrated as part of IPG 502, PVR extensions 504 may enable a seamless integration of IPG 502 with PVR functionality. This seamless integration may include, for example, using the same interface motif for PVR-related functions as is used for IPG-related functions. By providing such add-on PVR- enabling features to IPG 502, PVR equipment may be combined with IPG 502 to provide a single interface with which to operate both IPG 502 and the PVR equipment. In one suitable approach, PVR equipment having a PVR device may be coupled to PVR-compliant device 500 to provide PVR functionality. PVR equipment may include any combination of software, hardware, or both that provides PVR functionality using a PVR. PVR equipment may include, for example, a PVR sidecar, a PVR server, an integrated set-top box, or any other suitable hardware, software, or both that enables PVR functionality. PVR APIs 506 may be used to facilitate communication between the IPG and the PVR equipment. PVR APIs 506 may provide a set of routines, protocols, tools, or a combination thereof, for communicating with the PVR device . In one suitable approach, in the absence of an API standard for use with the PVR device, PVR APIs 506 may be vendor-specific. More particularly, in this approach, only certain PVR devices may be used in conjunction with PVR-compliant device 500. For example, PVR devices may be made to be compatible with a particular PVR-compliant device 500 having vendor- specific PVR APIs 506. Alternatively, PVR-compliant device 500 having vendor-specific PVR APIs 506 may be made to be compatible with a particular PVR device. A PVR vendor may be responsible for implementing PVR APIs 506 for a specific PVR device. In another suitable approach, PVR APIs 506 may be vendor-independent (e.g., based on industry standard or proprietary standard PVR APIs) . Designing PVR APIs 506 in this way may allow IPG 502 to be developed independently from the PVR device, providing flexibility in the selection of the PVR device. Also, PVR devices may be developed independently from PVR APIs 506. PVR APIs 506 may include functionality for determining the type (model, manufacturer, etc.) of PVR device being used. For example, PVR APIs 506 may include a library of multiple vendor-specific APIs, generic APIs, or both. In this approach, PVR APIs 506 may be used to determine which of the vendor-specific APIs should be used based on a determination of the type of PVR device coupled to PVR-compliant device 500 or by any other suitable criteria (e.g., using firmware 508, PVR extensions 504, or IPG 502) . In one suitable arrangement, PVR APIs 506 having a library of intelligent APIs may be implemented in PVR-compliant device 500. In this arrangement, PVR APIs 506 may automatically detect the PVR device when coupled to PVR-compliant device 500, test and diagnose the PVR device, and automatically generate the driver source code for the specific PVR device being used. FIG. 6 is a flow chart of illustrative steps involved in determining the type of PVR device being used. At step 602, PVR-compliant device 500 (FIG. 5) may monitor one or more communication channels (e.g., hardware interfaces) . This monitoring may be done in any suitable way. For example, any suitable "hot pluggable" technique (e.g., as used for a universal serial bus) may be used, whereby a peripheral hardware device may be detected when coupled accordingly. If a "hot pluggable" method is not supported, the PVR-compliant device may monitor one or more communication channels at power-up. The monitoring may be either a continuous, substantially continuous, or periodic process. At step 604, if and when the PVR device is coupled to PVR-compliant device 500, the PVR device may be detected. Upon detection of the PVR device, PVR-compliant device 500 may determine the type of device that has been coupled at step 606. The determination of the type of PVR device may be made, for example, using any suitable handshaking protocol. In one suitable approach, one or more of the PVR APIs 506 may be used to "handshake" with the PVR device. Based on the result of this query, a set of APIs of PVR APIs 506 that correspond to the type of detected PVR device may be selected for use in communicating with the PVR device at step 608. In another suitable arrangement, PVR APIs 506 having a library of intelligent APIs may be implemented in the PVR device. In this arrangement, PVR APIs 506 may automatically detect PVR-compliant device 500 when coupled to the PVR device, test and diagnose PVR- compliant device 500, and communicate with the specific PVR-compliant device 500 using the appropriate corresponding APIs. FIG. 7 is a flow chart of illustrative steps involved in determining the type of PVR-compliant device being used. The PVR device, or any other suitable device, may be coupled with PVR-compliant device 500 in step 702. The PVR device may then identify itself to PVR-compliant device 500 in step 704 using a "handshake" technique as discussed above. In another suitable approach, PVR-compliant device may receive indication from the user as to the type of PVR device being used in step 706. As a result of either of steps 704 or 706, the PVR device may then determine the appropriate PVR APIs to be used when communicating with the PVR-compliant device in step 708. The selected PVR APIs may then communicate with the PVR-compliant device in step 710. The foregoing description of monitoring techniques that may be used by PVR-compliant device 500 and the PVR device are to illustrate embodiments where the PVR device is implemented in PVR equipment separate from the PVR-compliant device. Such monitoring and detection would not be necessary if the PVR device were integrated into PVR-compliant device 500. However, in another suitable arrangement, PVR-compliant device 500 may have peripheral component interconnect (PCI) interfaces, industry standard architecture (ISA) interfaces, integrated drive electronic (IDE) interfaces, small computer system interfaces (SCSI) , or any other suitable interfaces that may be used to create an integrated device by way of the above-mentioned monitoring and detection. It will be understood that the PVR API programming constructs of Tables 1-10 are merely illustrative. Any other suitable API programming construct may be used instead of or in addition to those illustrated. It will further be understood that any suitable modification may be made to the APIs of Tables 1-10 in accordance with, for example, a particular arrangement of hardware, software, or both being used. One suitable function of the PVR APIs is to facilitate communication between IPG 502 of PVR-compliant device 500 and the PVR device implemented in PVR equipment. FIG. 8 shows one configuration of PVR software and hardware that may be used to implement PVR device 802 on PVR equipment or any other suitable equipment. In one suitable arrangement, PVR equipment may contain only PVR device 802. In other suitable arrangements, PVR equipment may include PVR device 802, other components of PVR-compliant device 500 (e.g., PVR APIs 506) , any additional hardware or software, or a combination thereof. PVR device 802 may include any suitable hardware, software, or both including, for example, circuitry 804, memory 806 (e.g., random access memory (RAM) or any other suitable solid state volatile or nonvolatile memory devices), hardware interfaces 808 (e.g., serial interface (i.e. RS-232), parallel interface (i.e. high-performance parallel interface (HIPPI)), universal serial bus (USB) interface, FireWire (i.e. Institute of Electrical and Electronics Engineering (IEEE) 1394) interface, wireless interface (i.e. wireless application environment (WAE) ) , RGB component interface, RJ-45 interface, telephone line interface, Ethernet interface, coaxial cable interface, optical interface, or any other suitable interface), software drivers 810, processors 812, storage devices 814 (e.g., hard-drives or any other suitable magnetic storage devices, optical storage devices, or any other suitable storage devices) , APIs 816, IPG or IPG-like applications 818, or any other suitable hardware or software. PVR device 802 may provide, among other things, functionality related to the recording, storage, scheduling, retrieval, and playback of television programming. It will be understood that PVR-compliant device 500 and PVR device 802 may be used in any suitable arrangement with any suitable additional software, hardware, or both. For example, components of PVR- compliant device 500 and PVR device 802 may be interchanged or otherwise moved from one to the other in any suitable way. In one suitable embodiment of the present invention, PVR-compliant device 500 may be used in conjunction with a PVR sidecar to provide PVR functionality as illustrated in FIGS. 9-14. In the arrangement illustrated in FIG. 9, PVR-compliant device 500 may be implemented in set-top box 900, which may be part of user television equipment 300 (FIG. 3) . PVR device 802 may be implemented in PVR sidecar 901. PVR sidecar 901 may include any suitable hardware, software, or both in addition to PVR device 802 to provide any suitable functionality. In one suitable arrangement, PVR sidecar 901 may include only PVR device 802 (as shown in FIG. 9) . PVR sidecar 901 may communicate with set-top box 900 via communications path 910, which may be any suitable wired or wireless communications path. For example, if wire-based, communications path 910 may be a serial cable, parallel cable, telephone cable, fiber optic cable, coaxial cable, Ethernet cable, USB cable, FireWire cable, component video cables, composite cables, any other suitable wire-based communications path, or any combination thereof. If wireless, any suitable communications protocol or standard such as IEEE 802.11, wireless application protocol (WAP) , radio frequency (RF) , Bluetooth, (Extended) time division multiple access (TDMA) , code-division multiple access (CDMA) , global systems for mobile communications (GSM) , or any other suitable wireless communications path or protocol may be used. PVR extensions 902 may be combined with IPG 904 to create a single software component. If PVR extensions 902 are not implemented as part of IPG 904 (as shown herein) , PVR extensions 902 may be independent software modules separate from IPG 904 and may communicate and function in conjunction with IPG 904. Programming modules that include PVR extensions 902 may be implemented locally using an installation device (e.g., a personal computer, personal digital assistant, USB installation device, etc.) or may be downloaded to set-top box 900 or PVR sidecar 901 from a remote location (e.g., a cable headend, a distribution facility (such as distribution facility 110), software support, a web server, or from any other suitable location) using a cable modem, an integrated services digital network (ISDN) modem, a DSL modem, a telephone modem, a virtual private network (VPN) , wireless connection, or any other suitable communications path or protocol. PVR device 802 in PVR sidecar 901 may communicate with IPG 904 having PVR extensions 902 via PVR APIs 906. In FIG. 9, IPG 904 having PVR extensions 902 and PVR APIs 906 are implemented in set- top box 900. PVR APIs 906 may be implemented locally in set-top box 900 using an installation device (e.g., a personal computer, personal digital assistant, etc.) or may be downloaded to set-top box 900 or PVR sidecar 901 from a remote location (e.g., a cable headend, a distribution facility (such as distribution facility 110) , a software support center, a web server, or any other suitable location) using a cable modem, an ISDN modem, a DSL modem, a telephone modem, a VPN, wireless connection, or any other suitable communications path or protocol . In another suitable arrangement, as illustrated in FIG. 10, IPG 904 and PVR APIs 906 may be implemented in set-top box 1000 while PVR extensions 902 and PVR device 802 are implemented in PVR sidecar 1001. IPG 904 may communicate with PVR APIs 906 via communications path 908 in set-top box 1000. PVR APIs 906 may in turn communicate with PVR device 802 via communications path 1010, which may be any suitable wired or wireless communications path. IPG 904 may communicate with PVR extensions 902 on PVR sidecar 1001 via communications path 1010. This arrangement is advantageous because it allows for a "plug and play" PVR sidecar that provides set-top box 1000 with the necessary PVR functionality (via PVR device 802) and application enhancements (via PVR extensions 902) together in a single sidecar unit. In FIG. 11, IPG 904 and PVR extensions 902 are implemented in set-top box 1100 while PVR device 802 and PVR APIs 906 are implemented in PVR sidecar 1101. This arrangement is advantageous because all components relating directly to the IPG are located on set-top box 1100 while all components relating directly to PVR functionality are located on PVR sidecar 1101. In FIG. 11, IPG 904 may communicate with PVR extensions 902 via communications path 908 in set-top box 1100. IPG 904 may communicate with PVR APIs 906 via communications path 1110, which may include any wired or wireless connection. Communication between components implemented in PVR sidecar 1101 may occur via communications path 1112, which may include serial connections, parallel connections, wireless connections, any suitable method for communicating information, or any combination thereof . PVR sidecar 1202 via communications path 1210, which may be any wired or wireless connection. FIG. 14 shows that IPG 904 with PVR extensions 902, PVR device 802, and PVR APIs 902, may be installed in PVR sidecar 1401. Because a full port of IPG 904 exists on PVR sidecar 1401, only IPG 904 may be implemented in set-top box 1400 to communicate with the components of PVR sidecar via communications path 1410, which may be any suitable wired or wireless connection. By installing a full port of IPG on both set-top box 1400 and the PVR sidecar 1401, the application implemented in the sidecar may operate on its own or in conjunction with the application on the set-top box. In the arrangement where the IPGs on the set- top box and PVR sidecar work in conjunction with one another, the set-top box port of the IPG may perform basic tuning functions, PPV functions, and authorization functions. The set-top box may receive out-of-band (OOB) data and may otherwise act as a pass-through for the PVR sidecar while the PVR sidecar may receive and process control commands from a remote control or any suitable user input device. A pass-through implies that, although the PVR sidecar is coupled to the set-top box, the PVR sidecar may be used as a communications medium for signals sent by the set-top box and may not provide any functionality. In this configuration, the PVR sidecar may generate all video overlays using, for example, a video overlay generator that may generate a user interface superimposed over programming being displayed. In another suitable approach, set-top box 1400 may monitor any communication to and from PVR sidecar 1401 via communications path 1410. If PVR sidecar 1401 is not detected, the IPG may function as it does without PVR functionality, using its own port of the IPG to provide basic IPG features. If the PVR sidecar is detected, however, the IPG may support PVR functionality. If the sidecar is removed, the IPG may detect the change and function as though there is no sidecar present, causing the PVR sidecar to operate in pass-through mode. In pass-through mode, the PVR sidecar may, for example, ignore all user commands from the IR remote control or may receive user commands and communicate them to the set-top box for execution. In pass-through mode, the PVR sidecar need not display programming or video overlays, but may rather pass this data directly from the set-top box to a display screen. In pass-through mode, the PVR sidecar may also perform passive functions such as accepting commands to purchase programming, maintaining in non-volatile memory all parental control settings, allowing parental control settings to be polled, checking whether a specific channel, rating, or title is locked, checking the validity of a parental control code or purchase code, or any other suitable function. PVR sidecar 1504, set-top box 1502, or both may communicate with software support 1508 or any other remote site via communications path 1512. Software support 1508 may be for vendor-specific applications located at a remote software support site, with which the PVR-compliant device may communicate to download additional software applications, software upgrades or any other suitable component associated with the components implemented in PVR sidecar 1504, set-top box 1502, or both. Communications path 1512 may also be used to download information not specific to the PVR sidecar, such as program guide data. Communications path 1512 may be a serial connection, parallel connection, wireless connection, any other suitable connection, or any combination thereof. PVR sidecar 1504, set-top box 1502, or both may upload user information to a remote site using communications path 1512. For example, PVR sidecar 1504 may be configured to communicate to with a remote site (such as a cable headend, distribution facility, software company, web server, or any other suitable location) information relating to a user's profile, preferred options, recorded programming, or any other information on PVR sidecar 1504 or set-top box 1502. PVR sidecar 1504 may receive guide data from set-top box 1502 which may be passed from the IPG's data channel, such as an out-of-band (OOB) data channel. This approach may allow the system to be deployed without having to put a new data delivery infrastructure in place. The IPG data may be augmented to accommodate more data then could be supported by or would be needed by the set-top box alone (e.g., between 14 and 30 days of data, or any other suitable amount of data, may be stored) . A separate data feed may be developed to support the PVR device. On a cold install, set-top box 1502 may tune to the non-PVR data channel until a sufficient amount of data is stored in local storage. The set-top may switch (under command from the sidecar) to the PVR feed. After a power outage, the set-top may tune immediately to the PVR feed because of data cached on the disk drive. PVR sidecar 1504 via its own IR command. IR commands may be relayed from remote control 1516 to set-top box 1502 via PVR sidecar 1504 in other arrangements. In additional arrangements, IR commands may be sent to and from PVR sidecar 1504 and set-top box 1502 that do not originate from remote control 1516. In the embodiment using the PVR sidecar, the PVR sidecar, set-top box, or both may also include third party applications to enable specific functionality or obtain a higher level of performance. Various classes of such third party applications may be used in conjunction with the PVR device. For example, applications may be independent of real-time video, or be time-dependant and rely on real-time video. These applications may be implemented in set-top box 1502 and launched by the IPG on PVR sidecar 1504 using commands sent over communications path 1510, which may be any suitable wired or wireless connection. When one of these applications launches, it may send a command to PVR device 802 (FIG. 8) to disable its functions. While that application is running, the sidecar may act in a pure pass-through mode. In another embodiment of the present invention a PVR server may be used to implement PVR functionality as illustrated in FIGS. 16-18. The PVR server may be located in any remote location, for example a cable headend, a distribution facility (such as distribution facility 110) , or a main facility (such as main facility 102) . The PVR server may be a mainframe computer, web server, network node, or any suitable device or devices for providing information over a network. The PVR server may be provided by, for example, a programming source or a third party service provider such as an application service provider (ASP) . The PVR server may provide PVR functionality to more than one set-top box. While it is desirable for PVR servers to serve set-top boxes in similar locations (to reduce latency and enhance the rate of communication between the set-top and the server) , it is not necessary for a server to serve only a specific location since PVR functionality may be identical over various geographic areas. In FIG. 16, PVR device 802 may be provided by PVR server 1601 while all other devices (e.g., IPG 904 having PVR extensions 902 and PVR APIs 906) may be located on set-top box 1600. IPG 904 may communicate with PVR APIs 906 via communications path 908. PVR APIs 906 may communicate with PVR device 802 via communications path 1610, which may include a wired connection, a wireless connection, or any suitable combination of connections. In FIG. 16, the user's local equipment (e.g. set-top box 1600) includes all hardware and software needed to interact with PVR device 802, which provides PVR functionality from a remote location. This arrangement is desirable because it offers users of set-top box 1600 the ability to easily integrate PVR functionality to their existing set-top box by providing plug and play functionality from PVR server 1601. In FIG. 17, both IPG 904 and PVR APIs 906 are implemented in set-top box 1700 while PVR device 802 and PVR extensions 902 are implemented in PVR server 1701. IPG 904 may communicate with PVR extensions 902 and PVR APIs 906 may communicate with PVR device 802 via communications paths 1710, which may include a wired connection, a wireless connection, or any suitable combination of connections. This arrangement may be found desirable because it equips the user with substantially all IPG components needed to communicate with PVR device 802 and PVR extensions 902. In another suitable arrangement, as shown in FIG. 18, IPG 904 having PVR extensions 902 may be implemented in set-top box 1800. IPG 904 may communicate with PVR APIs 906 on PVR server 1801 via communications path 1810, which may include a wired connection, a wireless connection, or any suitable combination of connections. This arrangement may be found desirable because substantially all components directed to providing integration of the PVR application are implemented in set-top box 1800 while substantially all components relating to the PVR functionality are located on PVR server 1801. In another embodiment of the present invention, shown in FIG. 19, the PVR device may be incorporated directly into an integrated unit such as set-top box 1900. In this arrangement, the PVR capability is available directly to the set-top box and no additional PVR equipment or communication paths may be needed to implement PVR device 802 to set-top box 1900. To support the integrated unit, the IPG may communicate with PVR APIs 906 to issue PVR-related commands. PVR APIs 906 may be implemented as a separately downloadable module that may communicate with PVR device 802 located on set-top box 1900. As with the other embodiments, communication occurs between PVR APIs 906 and IPG 904 having PVR extensions 902. Components implemented in set-top box 1900 may communicate via communications path 908, which may include a serial connection, parallel connection, wireless connection, any other suitable connection, or any combination thereof. By implementing PVR functionality to a PVR- compliant system in one of the foregoing manners, the IPG with PVR extensions may provide display screens with embedded PVR functions such as main menu display screen 2000 of FIG. 20. Main menu display screen 2000 may include various menu headings, such as program listings heading 2008, cable showcase heading 2010, and viewer services heading 2012. Program listings heading 2008 may be a heading for options relating to searching for or displaying program listings, such as search option 2014. Cable showcase heading 2010 may be a heading for options that are available from the cable provider, such as PPV option 2016. Viewer services heading 2012 may be a heading for options that provide various interactive services, such as PVR services, to a user. Such options may include recordings option 2018, scheduled recordings option 2024, and setup option 2026. Display screen 2000 may include advertisement 2002, 2004, and 2020 which may be used to promote any suitable program, product, event, reminder, or service, and may be selected by the user. Main menu display screen 2000 may be provided by the IPG until the user selects an option such as an option from viewer services menu 2012 that may involve PVR functionality, for example recordings option 2018. In the embodiment where a set-top box is coupled to a PVR sidecar, the user may interact with main menu display screen 2000 using the IPG implemented in the set-top box. When the user selects recordings option 2018, the IPG may send a request for a display screen associated with the user's request to the PVR extensions, which may be provided by the set-top box or the PVR sidecar. The PVR extensions may then provide the IPG with a display screen associated with the user's request. If the PVR extensions are provided by the PVR sidecar, a communications path may be used for communications between the set-top box and the PVR sidecar. The IPG working in conjunction with the PVR extensions may provide the user with PVR functionality and information provided by a PVR device implemented in the PVR sidecar. in one suitable arrangement, a full port of the IPG may be implemented in the set-top box, the PVR sidecar, or both. In this arrangement, display screens 2000, 2100 and 2200 may be provided by the PVR sidecar IPG while the set-top box IPG may perform functions in support of the PVR sidecar (i.e. managing PPV services) . In the embodiment using a PVR server, the IPG on the set-top box may send a request to the PVR extensions provided by the set-top box or the PVR server in response to the user selecting an option from viewer services menu 2012, such as recordings option 2018. The PVR extensions may then provide the IPG with a display screen associated with the user's request. If the PVR extensions are provided by the PVR server, a communications path may be used for communications between the set-top box and the PVR server. The IPG working in conjunction with the PVR extensions may provide the user with PVR functionality and information provided by a PVR device implemented in the PVR server. In the embodiment using an integrated set-top box, both the IPG and the PVR extensions may be implemented in the set-top box. The IPG may send a request to the PVR extensions in response to the user selecting an option from viewer services menu 2012 such as recordings option 2018. The PVR extensions may then provide the IPG with a display screen associated with the user's request. In a similar manner, search display screen 2100 of FIG. 21 may be provided by only the IPG until a user indicates a desire to record a given program using a PVR. In FIG. 21, the user may search for programs in a format provided by the IPG. Any navigational feature, for example, up and down arrow keys on the remote control, as indicated by scroll up indicator 2102 and scroll down indicator 2110, may be used to navigate the program listings menu. Each program listing 2112 may include a program rating 2106 and a recording indicator 2108 that shows whether a program is scheduled to be recorded. The user may record a program with the PVR device by highlighting and selecting a program 2104. Search display screen 2100 may be partially provided by the PVR device. For example, the program listings may include listings for both scheduled programs and recorded programs. The listings for the scheduled programs may be provided by the set-top box, and the listings for the recorded programs may be provided by the PVR device. The listings may include programs scheduled to be recorded, including an indication that they are to be recorded. The indication may be stored on the PVR device, and the set-top box may use the PVR device as a storage device to store program listings. While interacting with search display screen 2100, the user may indicate a desire to record the given program using the IPG or an input device such as remote control 408 of FIG. 4. When the user indicates a desire to record a program, the IPG may request a display screen from the PVR extensions that corresponds to the user's selection. The PVR extensions implemented in the set-top box, PVR sidecar, or PVR server may provide the IPG with display screens corresponding to the user's indication. If the PVR extensions are provided by a PVR sidecar or server, a communications path may be used for communications between the IPG and the PVR extensions. The IPG working in conjunction with the PVR extensions may provide the user with PVR functionality and information provided by a PVR device. For example, the PVR extensions may provide the IPG with recording setup screen 2200, shown in FIG. 22, in response to the user selecting a program provided by the IPG (FIG. 21) or in response to the user selecting a record option from remote control 408 (FIG. 4) . Display screen 2200 may provide the user with the ability to set or modify various recording settings, including the ability to schedule one-time and series recordings. The user may modify the selected options by using left and right arrow keys on the remote control as indicated by scroll left 2214 and scroll right 2216 indicators. The user may select record option 2202 after modifying the various options available or may cancel the recording at any time by selecting cancel option 2212. If desired, the IPG may provide the user with the ability to set a manual recording by specifying a channel, date and time, and duration to record (not shown) . Recording setup display screen 2200 may be provided by an IPG working in conjunction with PVR extensions. The IPG may provide a seamless look and feel to the display screen while the PVR extensions may provide the selectable options. When the user submits finalized options to be recorded from recording setup display screen 2200, the IPG with PVR extensions may send a command to be executed by a PVR device. If the user selects to record a program that will occur at a later time, the IPG with PVR extensions may delay sending the command to the PVR device, or the PVR device may delay executing the command until the program occurs. PVR APIs may be used to facilitate communications between the IPG with PVR extensions and the PVR device. The PVR device may be implemented in a PVR sidecar, PVR server, or an integrated set-top box. If located in a PVR server or sidecar, the PVR device may receive requests and provide functionality to the IPG and PVR extensions over a communications path via PVR APIs. Once the user selects record option 2202 and returns to screen 2100 of FIG. 21, scheduled recording indicator 2108 may appear for the listing the user has selected to record. The IPG may also provide the ability to initiate a recording from any program information screen by selecting the record option from a display screen provided at least partially by the PVR extensions, or by using a remote control such as remote control 408 (FIG. 4) . FIG. 23 is a flowchart of illustrative steps involved in providing the user with the ability to record programs using a personal video recorder application in conjunction with the PVR system of the present invention. According to this process, the PVR-compliant device may display program listings or other screen at step 2302, providing the user an opportunity to setup a recording. In response to the user initiating a recording setup from the program listings or other screen at step 2304, the system may provide the user with selectable record options at step 2306. 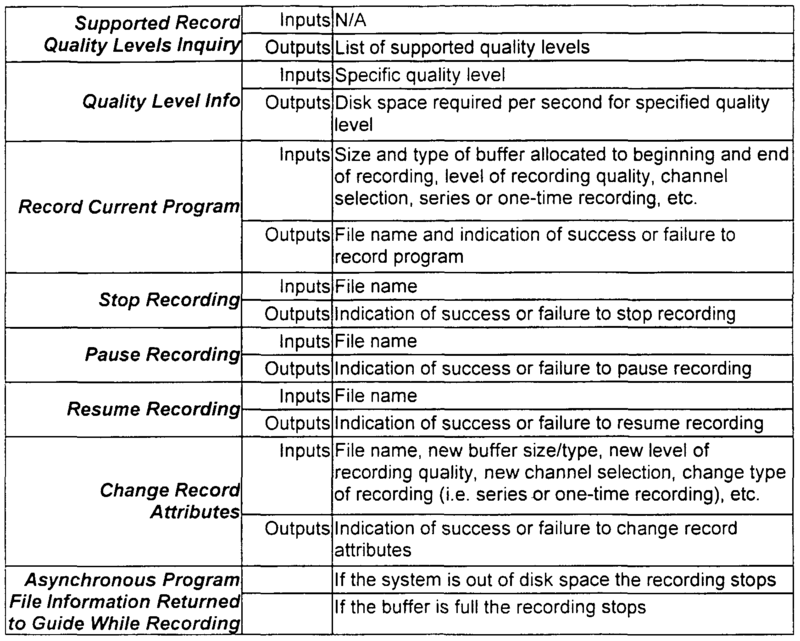 The user may then initiate recording by selecting record options at step 2308. The PVR-compliant device may allow the user to select quality at step 2310. The user may be able to select one of several recording qualities to control the amount of storage space required for recorded programs . For example, if the user selects higher quality more recording storage space may be required to record an individual program. By selecting lower recording quality, the user may be able to record more hours of programming in the same amount of storage space . The user may then determine if the recording is a one-time or series recording at step 2312. A one-time recording may record a single occurrence of a program while a series recording may record all occurrences of the program. If the user selects a one-time recording 2318, the PVR-compliant device may then provide the user an opportunity to select the program buffers at step 2320. If the user selects a series recording 2314, the PVR-compliant device may first provide the user an opportunity to select other options at step 2316 before providing the user opportunity to select program buffers at step 2320. The additional options for a series recording may include the number of programs to keep on the PVR device, the channels to include in the recording (e.g., all channels or just a specific channel), etc. Program buffers may be placed at the beginning and end of the scheduled program to ensure the entire program is recorded. The length of the buffer (s) may be selected by the user at step 2320. To help the viewer compensate for slight variations in broadcast times, the system may allow the viewer to specify an amount of time before and after the program to extend the recording time. For example, if the viewer knows that a program they watch regularly begins broadcasting two-minutes before the hour, the viewer may tell the IPG to begin recording two-minutes prior to the program's air-time to compensate for the early broadcast of the program. A detailed illustration of steps involved in applying buffers is later discussed in FIG. 24. When the user returns to the program listing at step 2322, the system may display program listings or other screen with record icons next to the programs that are scheduled to be recorded at step 2324. The recording process depicted in FIG. 23 may culminate when the system records the program as it occurs at step 2326. It will be understood that the steps of the process depicted in FIG. 23 may be performed in any suitable order. However, for the purpose of brevity and clarity, only one illustration of the process is provided. The PVR extensions have been designed to allow the viewer to initiate a recording with a single remote command anywhere a program appears in the IPG or while watching a program with no IPG screens or overlays . For example, the viewer may initiate a recording from a program listing screen, browse screen, flip bar, or program information screen simply by pressing the record key on the remote control (not shown) . When the viewer presses the record key while a program is selected on the user interface, the IPG may initiate a one-time recording and display an icon next to the program title indicating that a recording is currently scheduled for the program. Whenever the program listing appears on a display screen, the IPG may place the recording option next to the program title. FIG. 24 is a flowchart of illustrative steps involved in selecting buffers when recording a program in conjunction with the PVR system of the present invention. To apply the buffers selected by the user, more storage space may be allocated for recording the program. The PVR-compliant device may begin recording the program at a time earlier than the scheduled program start time as specified by the user. The PVR-compliant device may stop recording the program at a time later than the scheduled program end time as specified by the user. In response to the user initiating recording setup 2402, the system may provide the user an opportunity to allocate beginning and ending program buffers by selecting a time value in step 2404. In step 2406, the system may allocate the appropriate amount of storage space to accommodate the length of the buffers and the program being recorded. The system may then determine the time of recording in step 2408. In applying the beginning buffer 2410, the system may begin recording the program at the length of time selected by the user prior to the program's scheduled start time in step 2412. To apply the ending buffer 2414, the system may stop recording the program at the length of time selected by the user after the program is scheduled to end in step 2416. FIG. 25 shows display screen 2500 that comprises a list of scheduled recordings indicating the time the program is to occur 2510, the title of the program 2508, recording indicator 2108, rating 2506 and the date 2502. An IPG working in conjunction with PVR extensions may provide scheduled recordings display screen 2500. The user may navigate the list of scheduled recordings by using scroll up and scroll down keys on the remote control, as indicated by the scroll up 2514 and scroll down 2516 indicators. The user may select a program to view or edit the detailed information by selecting the program 2504. If the user selects a program that is scheduled to be recorded, the IPG may send a request to the PVR extensions to display a screen corresponding the users request or the IPG may display the screen and may use information retrieved by the PVR device . FIG. 26 is a flowchart of illustrative steps involved in providing the user with the ability to manage programs that are scheduled to be recorded using a personal video application in conjunction with the PVR system of the present invention. According to this process, the user may indicate a desire to access a list of scheduled recordings 2602, at which point the PVR- compliant device may display the scheduled recordings in step 2604. Detailed information may then be displayed in step 2608 in response to the user selecting a scheduled recording to manage 2606. The PVR-compliant device may then provide the user an opportunity to edit and save recording options for the program in step 2610, after which the PVR-compliant device may save the changes made by the user. The PVR-compliant device may provide access to scheduled recordings through a button on the main menu of the IPG. When the viewer wishes to modify the options for a scheduled recording or determine what recordings are scheduled, the viewer may access the scheduled recordings list such as the one depicted in FIG. 25, from the IPG main menu (FIG. 20) . Scheduled recordings may be shown on any listing screen or other IPG screen. Scheduled recordings may also be incorporated into a reminder list (FIG. 30) , which may be displayed whenever a reminder is executed. 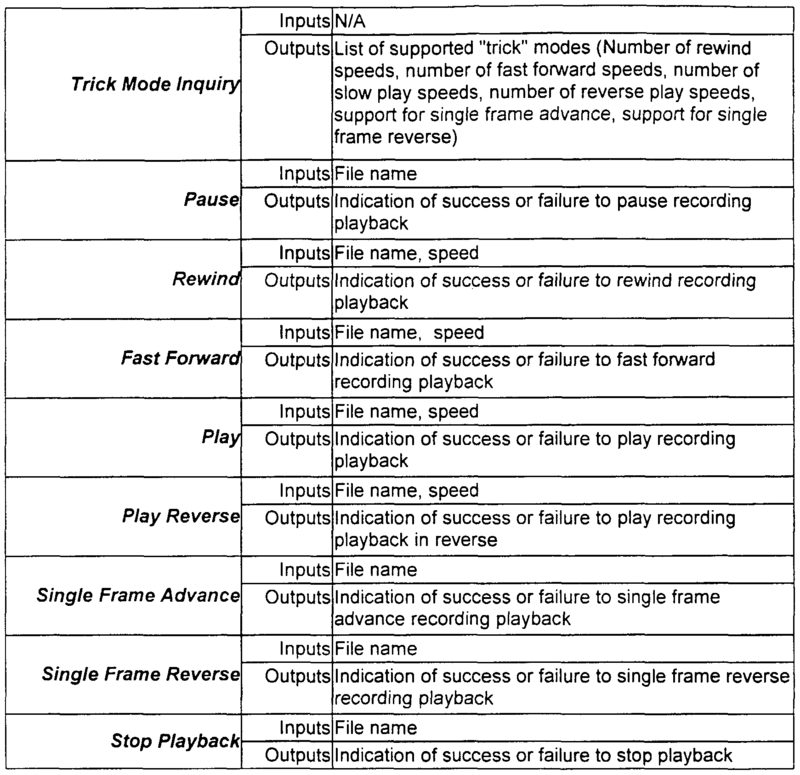 Once a program has been recorded by the PVR device, the IPG may provide recordings screen 2700, shown in FIG. 27, by working in conjunction with PVR extensions. The user may access recordings screen 2700 by interacting with main menu screen 2000 (FIG. 20) provided by the IPG or by some other technique using, for example, remote control 408 (FIG. 4) . In another suitable approach (not shown) , the list of recorded programs in display screen 2700 may be combined with the list of programs scheduled to be recorded in display screen 2500. The list of recorded programs and programs scheduled to be recorded may be further supplemented with all program listings that are scheduled to be presented by the IPG. Providing such integrated lists of programs may be an added convenience for the user. 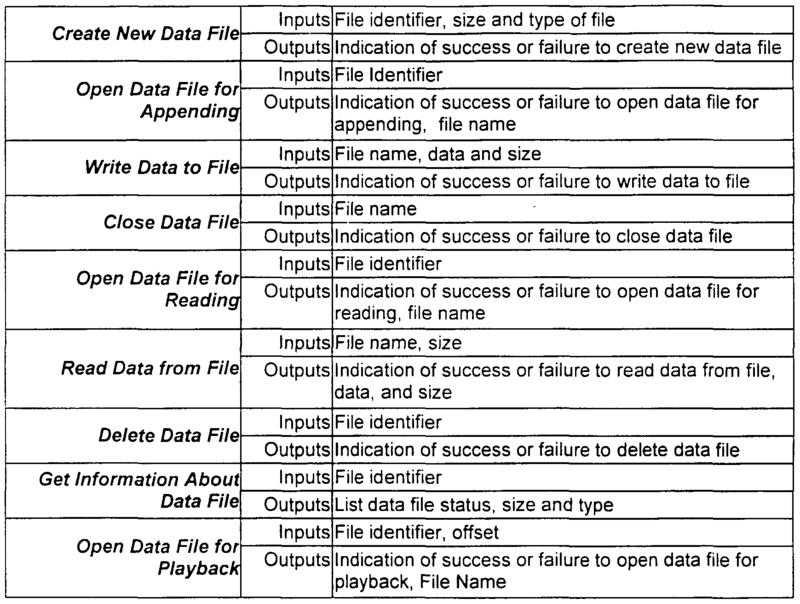 Recordings screen 2700 may include a list of recorded programs 2704 that the user may select. Screen 2700 may present security icon 2702 to indicate that the listed program may only be viewed by certain users or by entering a control code. Users or control criteria may have been identified while the user modified other options 2316 in the recording setup process (FIG. 23) . Television rating 2106 and scroll indicators 2708 and 2710 may again be provided to facilitate user interaction with screen 2700. The user may view a previously recorded program by selecting the program from recordings display screen 2700. The IPG may send a request to the PVR extensions upon receiving indication from the user to view a recorded program and the PVR extensions may provide a display screen consistent with the user's indication. If desired, listings for recorded programs may be shown on other IPG screens. In the embodiment where a set-top box is coupled to a PVR sidecar, the user may interact with recordings display screen 2700 using an IPG provided by the set-top box and PVR extensions provided by either the set-top box or the PVR sidecar. When the user selects a recording to view, the IPG and PVR extensions may send a request to a PVR device provided by the PVR sidecar to present the recording requested by the user. PVR APIs and a communications path betv/een the set-top box and the PVR sidecar may be used to facilitate communications between the IPG, PVR extensions and the PVR device. Other embodiments may include an IPG provided wholly or partially by the PVR sidecar. In the embodiment where a set-top box is coupled to a PVR server, the user may interact with recordings display screen 2700 using an IPG provided by the set-top box and PVR extensions provided by either the set-top box or the PVR server. When the user selects a recording to view, the IPG and PVR extensions may send a request to a PVR device provided by the PVR server to present the recording requested by the user. PVR APIs and a communications path between the set-top box and the PVR server may be used to facilitate communications between the IPG, PVR extensions, and the PVR device. Other suitable embodiments may include an IPG provided wholly or partially by the PVR server. In any of these embodiments, in response to the IPG's request to present a recording, the PVR device may generate a presentation of the recording in display screen 2802 of FIG. 28. The PVR device may generate the presentation using software, hardware, or both provided by the set-top box, PVR device, display screen, any suitable device, or a combination thereof. If the PVR extensions are provided by a PVR sidecar or server, a communications path may be used to communicate the recording presentation to the display screen. Video content of a recorded program may be provided by the PVR device and displayed in display screen 2802 of FIG. 28. A playback indicator, such as flip bar 2816, may be presented to provide the user an ability to control the recording playback. The title 2818 and time 2804 of the recorded program being displayed may also be presented by flip bar 2816, which may also include advertisements 2820. VCR-type features may be presented such as play option 2806, stop option 2814, fast forward option 2810, rewind option 2808, and pause option 2812. Playback of the recorded program may be controlled using typical VCR controls on a remote control (FIG. 4) . The user may interact with the playback control functions using the IPG with PVR extensions or the remote control. The IPG may send commands to the PVR device based on the user's indication. For example, the user may pause the playback of a recorded program by selecting pause option 2812 on flip bar 2816 or by selecting pause button 440 on remote control 408 (FIG. 4) . Upon receiving indication from the user to pause the playback of the recorded program, the IPG with PVR extensions may send a pause command to be executed by the PVR device . The PVR device may then suspend providing the presentation of the recorded program to display screen 2802. When the user selects to continue viewing the recorded program, by interacting with, for example, flip bar 2816 or remote control 408, the IPG with PVR extensions may send a command to the PVR device to continue providing the recorded program. Upon receipt of the IPG's command, the PVR device may execute the command and continue providing the recorded program to display screen 2802. FIG. 30 is an illustrative screen shot of a reminder feature. Video content may be presented on display screen 3002. The user may have previously indicated a desire to receive reminders while modifying the selectable options in the recording setup process 2400 or by some other technique. The IPG may have PVR extensions that may receive indication from a PVR device to provide record/reminder list 3012. In providing indication that a recording is scheduled to take place, the PVR device may use PVR APIs and a communications path to provide the IPG with PVR extensions the recording reminder indication. The IPG with PVR extensions may then present the reminder to the user. The recording reminder indication may be provided by the PVR device without a request or command sent from the IPG with PVR extensions to the PVR device. In some embodiments, the reminder list may be provided solely by the IPG without input from the PVR device. In FIG. 30, reminder display screen 3002 is presented with a list of scheduled recordings 3006 and reminders. The user may select hide list option 3004 to hide the recording reminder list or highlight a program and press the OK key on the remote control to watch the program to be recorded or with a reminder. Upon receiving indication from the user to watch the scheduled program as it is recorded, the system may automatically tune in the channel on which the scheduled program is to be presented. Scrolling indicators 3010 and 3014 may again be provided to assist the user in navigating the recording reminder list. Program guides that provide reminders are illustratively described in Bennington et al . U.S. Patent No. 6,331,877, which is hereby incorporated by reference herein in its entirety. 1. An interactive television system for providing a user with the ability to record television programming, the interactive television system having user television equipment comprising: a personal video recorder compliant device, wherein an interactive television program guide and personal video recorder extensions are implemented on the personal video recorder compliant device; and a personal video recorder device coupled to the personal video recorder compliant device, wherein the personal video recorder device comprises a full-port of the interactive television program guide and the personal video recorder extensions, and wherein substantially all interactive television program guide functionalities are provided by the personal video recorder device. 6. The system of claim 1 wherein the personal video recorder compliant device is implemented in a set- top box. 7. The system of claim 1 wherein the personal video recorder device is implemented in a personal video recorder sidecar. 8. The system of claim 1 wherein the personal video recorder compliant device and the personal video recorder device are integrated into a single enclosed unit . 9. The system of claim 8 wherein the single enclosed unit is a set-top box. 10. The system of claim 6 wherein functionalities related to commerce and authorization are provided by the set-top box. 12. The system of claim 1 wherein the interactive television program guide is a first interactive television program guide and wherein the personal video recorder device comprises software and hardware configured to implement a second interactive television program guide. 13. The system of claim 12 wherein the second interactive television program guide provides substantially similar functionality to that of the first interactive television program guide. 14. The system of claim 12 wherein the second interactive television program guide is used without the first interactive television program guide. 15. The system of claim 12 wherein the first interactive television program guide is used without the second interactive television program guide. 16. The system of claim 12 wherein the first interactive television program guide communicates with the personal video recorder device. 17. The sys tem of claim 12 wherein the second interactive television program guide communicates with the personal video recorder compliant device. 18. An interactive television system for providing a user with the ability to record television programming, the system comprising: a personal video recorder compliant device that is used by the user to interact with the interactive television system, the personal video recorder compliant device comprising: software and hardware configured to implement an interactive television program guide, software and hardware configured to implement personal video recorder extensions, and software and hardware configured to implement a plurality of application programming interfaces; and a personal video recorder device coupled to the personal video recorder compliant device, wherein the application programming interfaces are configured to facilitate communications between the personal video recorder device and the personal video recorder compliant device, and wherein the application programming interfaces are used irrespective of where and how the personal video recorder device is implemented. 19. The system of claim 18 wherein the interactive television program guide is a first interactive television program guide and wherein the personal video recorder device comprises software and hardware configured to implement a second interactive television program guide. 20. The system of claim 19 wherein the second interactive television program guide provides substantially similar functionality to that of the first interactive television program guide. 21. The system of claim 18 wherein the personal video recorder compliant device is implemented in a set-top box. 22. The system of claim 18 wherein the personal video recorder device is implemented in a sidecar arrangement as part of user television equipment. 23. The system of claim 18 wherein the personal video recorder device is implemented in a server arrangement at a location remote from the personal video recorder compliant device. 24. The system of claim 18 wherein the personal video recorder device is implemented as an enclosed integrated unit with the personal video recorder compliant device. 25. The system of claim 24 wherein the enclosed integrated unit is a set-top box. 26. The system of claim 18 wherein at least one of the plurality of application programming interfaces are vendor-specific application programming interfaces . 27. The system of claim 18 wherein at least one of the plurality of application programming interfaces are vendor- independent application programming interfaces . 28. The system of claim 18 wherein the plurality of application programming interfaces are configured to determine the type of personal video recorder device being coupled to the personal video recorder compliant device. 29. An interactive television system for providing a user with the ability to record television programming, the system comprising: a personal video recorder compliant device that is used by the user to interact with the interactive television system, the personal video recorder compliant device comprising: software and hardware configured to implement an interactive television program guide, software and hardware configured to implement personal video recorder extensions, and software and hardware configured to implement a plurality of application programming interfaces; and a personal video recorder device coupled to the personal video recorder compliant device, wherein the application programming interfaces are configured to facilitate communications between the personal video recorder device and the personal video recorder compliant device, and wherein the personal video recorder extensions and application programming interfaces are configured to provide a seamless integration of personal video recorder functionality with the interactive television program guide. 30. The system of claim 29 wherein the personal video recorder extensions are further configured to maintain a particular motif in the user interface of personal video recorder components integrated in the interactive television program guide according to a motif associated with the interactive television program guide. 31. The system of claim 29 wherein the personal video recorder extensions are further configured to allow the user of the interactive television program guide to perform all video recording functions associated with the personal video recorder device using the interactive television program guide. 32. The system of claim 29 wherein the personal video recorder extensions are further configured to allow the user of the interactive television program guide to schedule a program to be recorded before the program occurs. 33. An interacti ve television system for providing a user with the ability to record television programming, the system comprising: a personal video recorder device that is used by the user to interact with the interactive television system, the personal video recorder device comprising : software and hardware configured to implement personal video recorder extensions, and software and hardware configured to implement a plurality of application programming interfaces; and a personal video recorder compliant device with software and hardware configured to implement an interactive television program guide, wherein the personal video recorder compliant device is coupled to the personal video recorder device, and wherein the application programming interfaces are configured to facilitate communications between the personal video recorder device and the personal video recorder compliant device, and wherein the personal video recorder extensions and application programming interfaces are used to provide a seamless integration of personal video recorder functionality to the interactive television program guide. 34. The system of claim 33 wherein the personal video recorder extensions are further configured to maintain a particular motif in the user interface of personal video recorder components integrated in the interactive television program guide according to a motif associated with the interactive television program guide. 35. The system of claim 33 wherein the personal video recorder extensions are further configured to allow the user of the interactive television program guide to perform all video recording functions associated with the personal video recorder device using the interactive television program guide. 36. The system of claim 33 wherein the personal video recorder extensions are further configured to allow the user of the interactive television program guide to schedule a program to be recorded before the program occurs . 37. A method for providing a user with interactive television program guide functionality using user television equipment having a personal video recorder compliant device and a personal video recorder device, which are coupled to one another, the method comprising: allowing the user to control the interactive television program guide functionality by sending a command to the personal video recorder compliant device; generating a signal at the personal video recorded compliant device, wherein the signal corresponds to the command; and communicating the signal to the personal video recorder device, wherein the signal is used by the personal video recorder device to execute the command. 38. The method of claim 37 further comprising seamlessly integrating functionality associated with the personal video recorder device with the interactive television program guide. 39. The method of claim 37 further comprising providing personal video recorder application programming interfaces that are configured to determine the type of video recorder device being coupled to the personal video recorder device . 40. The method of claim 37 wherein the generating a signal comprises generating an infra-red signal . 41. The method of claim 37 wherein the generating a signal comprises generating a command to record a program. 42. The method of claim 37 wherein the generating a signal comprises generating a command to view a recorded program. 43. A method for providing a user with interactive television program guide functionality using user television equipment having a personal video recorder compliant device and a personal video recorder device, which are coupled to one another, the method comprising: allowing the user to control the interactive television program guide functionality by communicating a command to the personal video recorder device; generating a signal at the personal video recorder device, wherein the signal corresponds to the command; and communicating the signal to the personal video recorder compliant device, wherein the signal is used by the personal video recorded compliant device to execute the command. 44. The method of claim 43 further comprising seamlessly integrating functionality associated with the personal video recorder device with the interactive television program guide. 45. Th e method of claim 43 further comprising providing personal video recorder application programming interfaces that are configured to determine the type of video recorder device being coupled to the personal video recorder device. 46. The method of claim 43 wherein the generating a signal comprises generating an infra-red signal . 47. The method of claim 43 wherein the generating a signal comprises generating a command to record a program. 48. The method of claim 43 wherein the generating a signal comprises generating a command to view a recorded program. 49. A method for allowing a personal video recorder compliant device to communicate with a personal recorder device, the method comprising: coupling the personal video recorder device to the personal video recorder compliant device; detecting the personal video recorder device being coupled; determining the type of personal video recorder device being used based on information received from the personal video recorder device; and establishing communications between the personal video recorder device and the personal video recorder compliant device. 50. The method of claim 49 wherein the determining the type of personal video recorder device being used compromises using a handshake protocol to request and receive the information from the personal video recorder device. 51. The method of claim 49 wherein the determining the type of personal video recorder device being used compromises using application programming interfaces to interpret in the information received from the personal video recorder device. 52. A machine readable medium having machine program logic recorded thereon for: allowing a user to control an interactive television program guide's functionality by sending a command to a personal video recorder compliant device; generating a signal at the personal video recorded compliant device, wherein the signal corresponds to the command; and communicating the signal to a personal video recorder device, wherein the signal is used by the personal video recorder device to execute the command. 53. The machine readable medium of claim 52 further comprising machine program logic recorded thereon for facilitating communications between the personal video recording device and the personal video recording compliant device using. 54. The machine readable medium of claim 53 wherein the machine program logic comprises using application programming interfaces. 55. The machine readable medium of claim 52 further comprising machine program logic recorded thereon for providing the user with the ability to playback a recorded program. 56. The machine readable medium of claim 55 wherein the machine program logic comprises allowing the user to manipulate the playback of a recorded program. 57. The machine readable medium of claim 52 further comprising machine program logic recorded thereon for: providing a first interactive television program guide on the personal video recorder compliant system; and providing a second interactive television program guide on the personal video recorder system. 58. The machine readable medium of claim 57 further comprising machine program logic recorded thereon for integrating the first interactive television program guide and the second interactive television program guide . 59. The machine readable medium of claim 58 wherein the machine program logic comprises using personal video recorder extensions. 60. A machine readable medium having machine program logic recorded thereon for: allowing a user to control an interactive television program guide's functionality by communicating a command to a personal video recorder device; generating a signal at the personal video recorder device, wherein the signal corresponds to the command; and communicating the signal to a personal video recorder compliant device, wherein the signal is used by the personal video recorded compliant device to execute the command. 61. The machine readable medium of claim 60 further comprising machine program logic recorded thereon for facilitating communications between the personal video recording device and the personal video recording compliant device using. 62. The machine readable medium of claim 61 wherein the machine program logic comprises using application programming interfaces. 63. The machine readable medium of claim 60 further comprising machine program logic recorded thereon for providing the user with the ability to playback a recorded program. 64. The machi ne readable medium of claim 63 wherein the machine program logic comprises allowing the user to manipulate the playback of a recorded program. 65. The machine readable medium of claim 60 further comprising machine program logic recorded thereon for: providing a first interactive television program guide on the personal video recorder compliant system; and providing a second interactive television program guide on the personal video recorder system. 66. The machine readable medium of claim 65 further comprising machine program logic recorded thereon for integrating the first interactive television program guide and the second interactive television program guide . 67. The machine readable medium of claim 66 wherein the machine program logic comprises using personal video recorder extensions. 68. A machine readable medium having machine program logic recorded thereon for: coupling a personal video recorder device to a personal video recorder compliant device; detecting the personal video recorder device being coupled; determining the type of personal video recorder device being used based on information received from the personal video recorder device; and establishing communications between the personal video recorder device and the personal video recorder compliant device. 69. An interactive television system for providing a user with the ability to record television programming, the system comprising: means for allowing the user to control an interactive television program guide's functionality by sending a command to a personal video recorder compliant device; means for generating a signal at the personal video recorded compliant device, wherein the signal corresponds to the command; and means for communicating the signal to a personal video recorder device, wherein the signal is used by the personal video recorder device to execute the command . 70. An interactive television system for providing a user with the ability to record television programming, the system comprising: means for allowing the user to control an interactive television program guide's functionality by communicating a command to a personal video recorder device; means for generating a signal at the personal video recorder device, wherein the signal corresponds to the command; and means for communicating the signal to a personal video recorder compliant device, wherein the signal is used by the personal video recorded compliant device to execute the command. 71. An interactive televis ion system for providing a user with the ability to record television programming, the system comprising: means for coupling a personal video recorder device to a personal video recorder compliant device; means for detecting the personal video recorder device being coupled; means for determining the type of personal video recorder device being used based on information received from the personal video recorder device; and means for establishing communications between the personal video recorder device and the personal video recorder compliant device.